We love ice, and we've loved it ever since the dawn of civilization. Early humans treasured it and found ways to dig ice out of rivers and keep it cold even through summer. Today, having regular access to ice is as simple as getting a Scotsman ice machine to make sure we never run out of frozen H2O. Once the home freezer was invented, the ice cube tray was practically a no-brainer. By the turn of the 20th century, we were working on machines that could make ice for us. Today there are plenty to choose from. While a small machine may do for the home, for restaurants, bars, and any other establishment serving lots of cold drinks, a more substantial ice maker is an important investment. 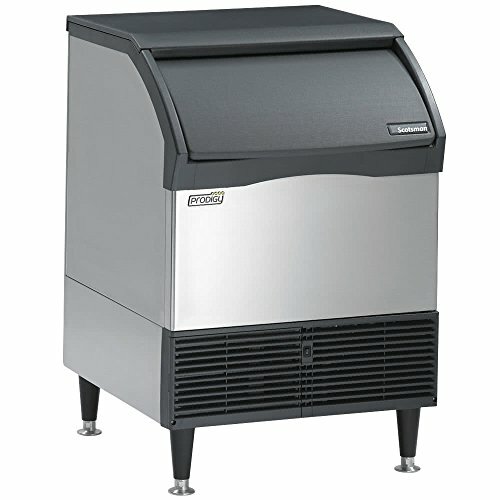 What Is The Prodigy Plus Scotsman Ice Machine? 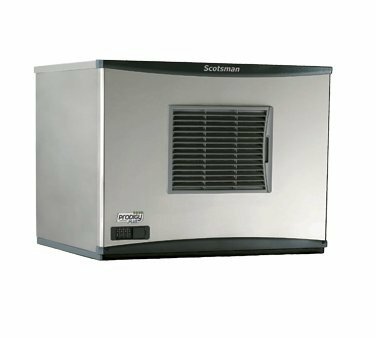 The Scotsman Prodigy Plus is one of the smallest, yet most efficient automatic Scotsman ice machines available. It's capable of producing ice in various sizes and shapes, yet using a minimum of water and electricity in the process. In fact, it's far more efficient than most other machines. This Scotsman ice machine can do cubes, flakes, or nuggets of ice. It comes with an excellent air filter in the front panel which means the machine breathes better and doesn't overheat as easily. This means more efficient operation and faster production of ice. It also means the Scotsman ice machine doesn't need a lot of clearance on either side, so it's the perfect machine for installing under the counter. 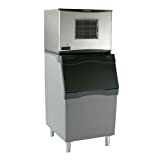 You can get this Scotsman ice machine in either a 22-inch width or a 30-inch one, and both have a very small footprint, especially in a commercial kitchen. Both use Scotsman's patented Harvest Assist, which used a probe and a squirt of hot gas to push out the cubed ice from the evaporator bin. This means the ice never bridges or freezes over and every cube is uniform in size. Ice machines for a commercial environment are going to cost more than home ice makers. But, there's a reason for that, and with any of the Scotsman ice products, you can expect a lot of value for your investment. The Prodigy Plus is available, new, for just under $$$. This is one of the most efficient and durable models that Scotsman Ice Makers offers, and this price tag comes with a lot of perks to take the sting out of the cost. There is amazing value for money with this machine that can generate 400lb of ice in a day. This machine is designed from the ground up to give excellent performance with very little effort. The external lights let you see what's happening and automate the process of purging out water that's full of minerals and likely to clog the system. The machine also offers one-touch cleaning, which means you'll never fight over whose turn it is to clean it out. For the most part, this product ships ready to go. It needs about six inches of clearance at the back and along the sides, and a bit more above. There has to be a connection to a floor drain, but this is just about the only thing the buyer has to do to set it up. The design of this machine is excellent. The front-mounted filter makes it easy to keep cool and change the filter. Cleaning is a snap, and this Energy Star-certified ice maker uses half the energy and water of many other modules. The machine runs nearly silently and is easy to maintain. Scotsman offers a good warranty on this machine. It covers the parts and labor on the evaporator, compressor, and condenser for five years. The parts and labor on all other components are warrantied for three years. Be aware that you must register the machine to get further details and validate the warranty. Energy and water efficiency – Uses significantly less water and energy than other cube ice machines. This Scotsman ice machine is similar to the one reviewed above but smaller. While the previous machine can do 400lb of ice per day, this one is only able to do a maximum of 80lb. That being said, it is supposed to be that way. This machine fills the need for a truly space-saving, efficient machine. While the absolute cost of the machine is far lower than the one, we first reviewed that's because it's quite small. In terms of the value of money, this one isn't as good. This model is less than 30% cheaper, depending on where you buy it, but makes 80% less ice in a day. Additionally, though it will fit conveniently under the counter, you have to buy a separate kit to make that possible in compliance with ADA standards. Like most Scotsman ice machines, this one is simple and easy to use. The control panel is intuitive and easy to navigate, and it comes with a cord set, ice scoop, and optional legs to raise it up. The antimicrobial compound its coated with makes it fairly easy to clean. This is a "plug and play" system for the most part. You'll need a grounded plug, a place where the air temp doesn't go up much over 70 degrees, and access to a maximum of a 50-degree water source. It fits under any counter 39 inches or higher and needs an external drain. If you want it to be ADA compliant, you have to buy and install a separate kit. The design here is good but missing a few tricks that the C0330SA can do. The real benefit of this machine is a small size. It's absolutely perfect for certain applications, such as under a bar counter. But it does require more effort to clean, and it's a bit picky about the air and water temps it needs. It only makes a max of 80lbs of ice in a day and only makes one style of ice. This machine from Scotsman ice is billed as a "gourmet" under-counter unit. It creates only 65lb of ice in a day and can only store 26lb at one time. What sets it apart is the great flavor the ice, which is guaranteed to be free of odor and taste. Using it in your drinks will never alter the flavor profile. Additionally, this can be used both indoors and outdoors. This one is also fairly pricey, but it has some excellent features that make it good value, even though it produces less ice. Being able to use it outdoors as well as indoors is a real plus, and the filtering system that turns out perfectly clean ice is a real plus. And while this one only turns out a max of 65lb of ice per day, it is extremely small and useful for patios, private offices, or a home bar. This machine is very simple and easy to use. You don't even need to install a drain, and the control panel is clear and easy to use. The WaterSense technology automatically flushes hard water, and its accompanying minerals, so you don't have to worry about constant descaling. It doesn't get any easier to put this thing together. All you have to do is plug it in. It uses a gravity drain and doesn't care nearly as much about the temperature of the water you put in it and the air it's sitting in. The only real downside is that the size of the machine makes it a bit harder to connect the water and drain lines than other models. Overall, this is a good design. It works well and turns out fabulous ice without a hint of contamination. If all your drinks are top shelf, this is the model for you. That being said, it is noisier than a lot of models. That's fine if you keep it outside, but since it's also billed as great for home rec rooms and private offices, some people will find it too loud. Scotsman only warranties the parts and labor on this one for a year. The exception is the compressor and condenser, which are warrantied for five. Be aware that you must register the machine to get further details and validate the warranty. This is the granddaddy of the Scotsman ice machines and the kind of style you'd expect to see in high-trafficked areas like hotel hallways. It makes a whopping 525lb of ice every 24 hours and can store an amazing 536lb. Like others in the line, it is highly efficient and can preserve ice for a long time. There's a high initial cost here, but this machine is a great value for the money. You're paying just a bit more than twice what you would for the small under-counter models, but you're getting exponentially more ice out of that. If endless amounts of ice are what you need, this is the machine for you. This may be the easiest of all to use, and that's good if you're planning on offering guests, patrons, employees, or patients ready access to it at all time. The lights are easy to understand, the entire thing is covered in an anti-microbial compound, and it's easy to remove the baffle and clean it. This one takes a bit longer to set up than some other models, mostly due to the size. You'll need a minimum of 12 inches of space all around for good air flow, and you'll also need to purchase a few separate kits if you want to install it in a way that you can get maximum production from it. This thing is a workhorse and designed to take a beating. If you install it optimally, it will last a long time, even with constant use. All the Scotsman products are highly rated for a reason. 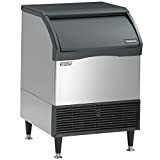 These are the standard when it comes to commercial ice machines. If you're in great need of a small, efficient machine, especially for home use, we recommend the Scotsman CU50GA-1A. If you need more serious ice-making power, the best value for your money, in our opinion, is the Scotsman C0330SA-1 Prodigy Plus.